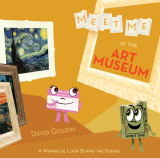 Meet Me at the Art Museum by David Goldin is one of the easiest to take instructive picture books I can recall reading in quite some time. It uses the old night-at-the-museum situation with a docent's name tag giving a ticket stub an after-hours tour. This thing gets really simplistic, going so far as to explain what a coat check room is and that there are signs all over the place telling you what to do. But, you know, it's a picture book. It's for kids who presumably have never been into a museum. When I go to a museum, I like to go to the coat check first thing. What a curator does, what a conservator does, what an archivist does, what a historical artifact is...I love this stuff. I also loved the reproductions of artwork sprinkled throughout the book. On page 14 you'll see A Sunday Afternoon on the Island of La Grand Jatte by Georges-Pierre Seurat or, as one of my kids once told me, A Picture of a Woman Walking Her Monkey. I don't know why I'm so fond of that work. Meet Me at the Art Museum would be a fine addition for libraries, schools...and museum bookstores!